Our free Poison Prevention Training Program consists of several online modules meant to teach others about poisonings and how to prevent them. Need to order some educational materials? 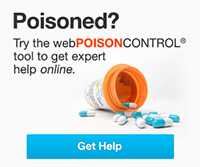 You can get Poison Help magnets, stickers, and brochures free of charge! National Prescription Drug Take Back Day is taking place on Saturday, April 27! This is a great opportunity to find a nearby collection site and get rid of any unused medications that may be in your home. When should I induce vomiting? What if I suspect someone has been poisoned? Who are the Poison Center's most frequent callers? When is the Poison Center the busiest? What are the most common exposures the Poison Center is consulted on? What should I do if my pet has been poisoned?